In order to completely convey and be true to the essence of the original recording and source, the all important cables connecting each component to the next within a given system must ultimately transfer signal WITHOUT filtering, adjusting, or losing information, and WITHOUT adding distortions or noise, all in consideration of the highly variable reactive nature of and between components within their respective environments, with respect to the system as a whole. A daunting design task if the ultimate goal is to closely reproduce the original event with such clarity as to invoke a positive emotional response, linking the objective to the subjective. The Aluminata Series, The World's Absolute Finest Cables. A typical shield, while at times necessary, has many faults - First, they are usually very thin foil or braid and poor conductors at many frequencies, passing and transferring noise into the conductors beneath to ride with the original signal; Second, they are excellent long antennas for noise, both in receiving it from the air and in radiating it from your already contaminated wall outlet or from noisy components they are connected to into the rest of your system (examples of noise sources are home wiring, transmitters, microwaves, wireless devices, computers, electronics, and all digital player of media...). Third, shields ALL try to dump the noise they pick-up to the ground lead or chassis of the connected equipment, and in the case of an AC cord, also to the earth grounded third prong of your homes electrical ground, ultimately finding its way into other equipment through the other AC cords and cables, adding further contamination as they 'do their job'. This in part explains why a system may sound better with some grounds disconnected, though possibly a dangerous situation as this bypasses a component's electrical safety guards and prevents it from protecting itself in the case of a surge. To sum this mess up, evasive and invisible noise travels freely throughout your high-end system causing reduced system resolution and dramatic loss of performance. The Aluminata series boasts the worlds first, patent pending, Particle Aluminum Shield (PAS). Imagine a shield so thick that noise at any frequency or severity cannot possibly pass through it. A shield itself of 3 pounds/1.9 kg in overall weight at a two meter length, but yet as flexible as a snake! JPS takes an ultra-pure aluminum alloy, their specialty, and diamond cuts it into tiny particles sifted through a fine grating to assure consistency to create a shield providing true 100% coverage at all frequencies from the elusive and difficult to reject megahertz (MHz) range well into the gigahertz range (that's many of 1000's of MHz), more effective than ANY other shield. About 0.5 inches (12 mm) thick on the larger speaker and AC power cables (proportionately smaller on the interconnects), PAS is easily the most extensive cable shield ever implemented, and nothing less than you would come to expect from the long-term experts in noise rejection. 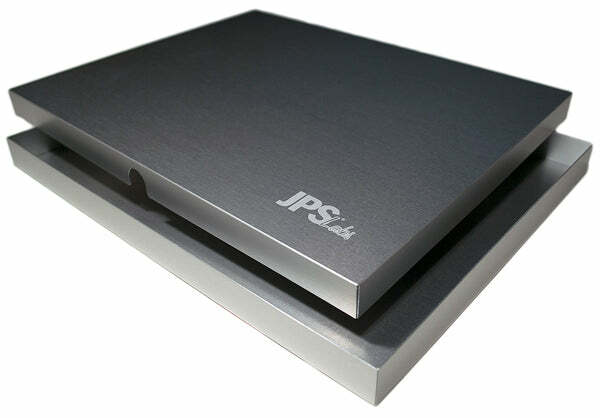 Yet with all its vibration dampening, noise absorbing mass, this unique JPS shield is not reactive to any power traveling through the wires blanketed underneath. The oversized conductors within the speaker and AC power cables can carry in excess of 60 amps or 14,000 watts continuous, and over 250 amps or 48,000 watts instantaneously current, without audible power loss even with the largest of amplifiers, yet these JPS trademark Particle Aluminum Shield cables with their ultra-high noise immunity allow for the very subtle nuances contained in the lowest milliwatt (that's a few thousandths of a watt) power levels of the music to shine through. Within these very delicate low levels are where the real music resides, where the feel and human side show themselves, and where Aluminata shines like no other cable. Beginning with their existing and very successful power cords, JPS set out to define every single parameter in AC cord technology which can be improved upon even by JPS' already high standards as in the world class Kaptovator AC cord, a long-time benchmark of premium AC cables. Then one day it hit, what about current reflections in the AC line? While researching such a phenomenon, Joe found that electrical current, analogous to water flow in a pipe, does not appreciate being suddenly stopped and started (as it is with an amplifier and its sudden changes to power requirements). This constant change in current flow, particularly where the homes AC wiring is not as good as it could be, creates reflections- or ripples- all the way back to the breaker panel, impeding the smooth flow of power to the system. So JPS added another world first feature, End of Line (EOL) technology, and incorporated it into this cord as a unique, proprietary element which dissipates reflections within the cord itself, allowing bass to sound like it should, tight and detailed, while clearing the air in the mid's and highs; very similar to upgrading the entire systems cabling, and all accomplished by the addition of this very unique AC cable. Add the blanket of the Particle Aluminum Shield described above to completely isolate and absorb all forms of noise between the wall outlet and the component for pure clean power and all that remains is a clarity to audio or video resolution that no other component or cable change can possibly offer. If you are ready for an amazing cable, designed from scratch to fit a particular application, that has since 2003 converted the 'high-end', high-performance, audio industry- Look no further than the JPS Labs Aluminata AC Cable. 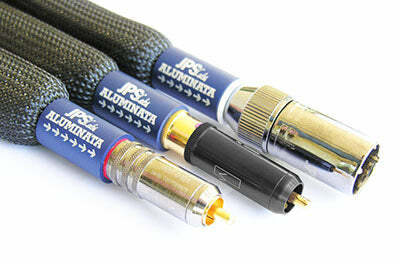 As with all JPS designs, we begin each with the conductor materials themselves, and the new Aluminata speaker cables are the finest statement of what JPS' Alumiloy wire can do, complete clarity to music with an amazing ability to hear the emotions, vocals as real as real can be, and first class bass definition with the rolling decay of drums, just as if you're there! For the first time, cables without limitations supercharge quality loudspeakers to a level of resolution never before realized even by our high standards, with perfect balance from top to bottom. No hints of any smearing, no loss of the lowest levels of micro detail, no brightness, no sibilance, only beautifully smooth clarity, smoother than any musical reproduction you've ever heard in your lifetime, coupled with amazing dynamics, bringing a system as close to perfection as one could hope. Aluminata Speaker cables simply allow for the absolute finest enjoyment any system can offer, and when combineed with the Aluminata interconnects and AC cables, a system wired completely with Aluminata becomes the most adictively live musical reproduction you have ever heard in your room. Huge 5 AWG/16.8 mm2 Alumiloy conductors offer no restrictions even on the most demanding loudspeakers while allowing the amplifier complete control over woofer dynamics, even in longer lengths or demanding speaker impedances, this cable begs for a challenge. Special tubular dielectrics seal the conductors from environmental concerns while negating absorption of the lowest level of detail our Alumiloy wire can convey, all blanketed by our Particle Aluminum Shield providing complete noise containment and absorption, as well as very effective mechanical vibration dampening. Like a finely tuned instrument, Aluminata speaker cables perfectly compliment any fine loudspeakers with the impeccable balance, poise, and craftsmanship the worldwide audio community has come to expect from JPS Labs. In order for interconnects to transfer low level signals without adding distortion or noise, they must not only be made with the finest conductor materials and dielectrics, but also be able to deal with ground loops not only at 50 and 60 Hz but all the way up into the many hundreds of megahertz (MHz) and beyond. This random additional noise causes contamination of the signal, adding harshness and masking low level detail. EMI (electromagnetic interference) from nearby AC wiring, dielectric absorption, capacitive loading, you name it, the interconnects are where it all goes wrong within a system. 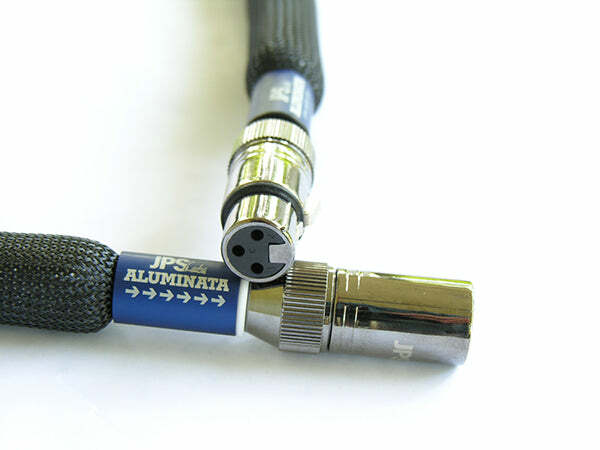 Aluminata interconnects address these issues to the highest possible level, offering a degree of noise and hum immunity unkown until now, with the result of perfectly tuned clarity of sound, not bright, not dull, a reflection of the source. A quad lay of a newly designed and specially annealed solid core Alumiloy conductors (the equivalent of two 12 AWG/3.31 mm2 conductors for negligible signal loss, even in long lengths, each conductor individually insulated with very expensive medical grade Kapton to exacting standards of thickness and purity, blanketed by a version of the Particle Aluminum Shield, modified and optimized for high resolution, line level audio, with its inherent noise absorption and ultra low impedance, Aluminata interconnects set the stage for a JPS wired system of impeccable quality of sound sure to give you goose bumps and an occasional tear for years to come, and complete the loop from source to ear like only JPS can. The Aluminata Series encompasses all factors in the design of highly advanced audio and AC power delivery offering a truly holistic cabling solution. Their ability to enhance a system's performance goes well beyond expectations and provides an absolute reference by which others will be judged far into the future. These are the only application specific cables on the planet that were individually engineered yet act as a whole to reduce all known sources of background noise within a high resolution audio system to such a low level that the change is... unmistakably audible. Every Aluminata Cable set is serial numbered, and comes with their own aluminum case laser engraved with the JPS Labs logo, and a matching original Certificate of Authenticity, printed with gold and blue ink, and embossed and signed with our official Authentic Product seal. This certificate ensures you are buying a genuine JPS Labs product. - Particle Aluminum Shield (PAS) is approx. 0.5"/12 mm thick and effectively shields and absorbs environmental and component noise- In our humble opinion, there is no better shield available on any cable on planet Earth. - With a 100 watt amplifier at full output into a 4 ohm loudspeaker, a 2.4 meter cable only will drop 0.001 watts,. Maximum amplifier power 15,000 watts (15 KW). - Particle Aluminum Shield (PAS) is approx. 0.3"/7.5 mm thick and effectively shields and absorbs environmental and component noise- In our humble opinion, there is no better shield available on any cable on planet Earth.